This rose is composed of 75% Cabernet Sauvignon and 25% Merlot. It has an amazing deep red color despite being a blush and perhaps this is what drew me to purchasing the bottle at the bottle shop. I have had an incredible craving for rose in the last few days for some odd reason..... Maybe it's because I haven't been able to drink wine in the last week or so because I've been sick with both the flu and the cold. I feel the need to drink something fresh and vibrant and to smell wine with an amazing bouquet. Good rose often exudes those qualities for me and so hence I purchased this wine. On the nose I immediately notice the essence of rose petal. I also get bright cherry and strawberry notes that combine with subtle mineral and stone characters. On the palate the wine is bursting with intense sour cherry flavors and some really delineated mineral notes. It's quite a textured and full bodied rose that coats the palate and finishes long. It also has a nice fresh acidity and would be amazing with smoked salmon! 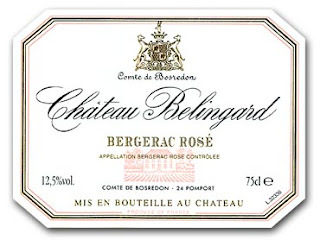 You require time to create that attractive and in addition real effort to make such a high-quality blog post 2008 Chateau Belingard Bergerac Rose.